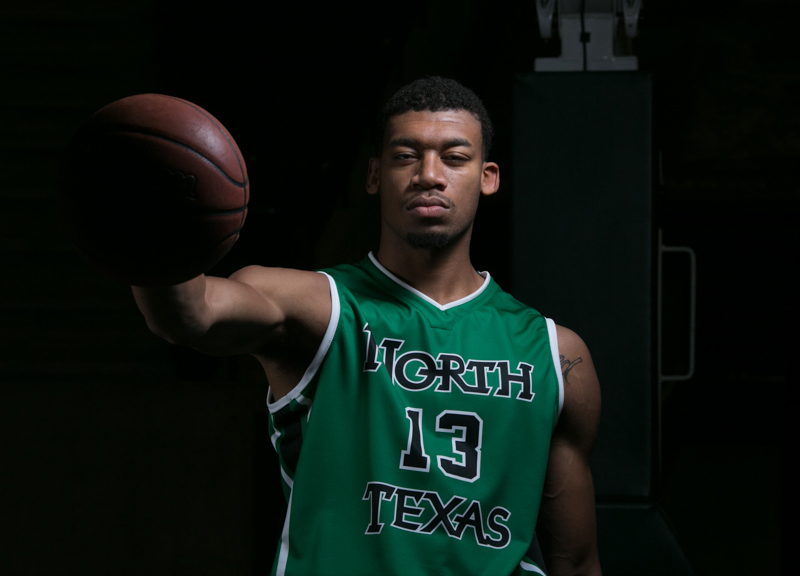 UNT Basketball Star Tony Mitchell Tells Us About Life Off The Court. This year's seen all sorts of hype doled upon sophomore University of North Texas baller Tony Mitchell, all stemming from his highly-successful freshman campaign. Whether he's able to live up to this hype, well, that's still to be determined. See also: BEING GREEN. Everyone's Touting North Texas Hoops Star Tony Mitchell. But Is He Worth All The Hype? The funny thing about all this attention, though? Much as might now be known about Tony Mitchell the basketball player, there isn't much to be found about Tony Mitchell the 20-year-old. A couple weeks back, we sat down with Mitchell to get to know him a little better off the court. Over the course of our conversation, the phenom told us what he was like as a kid, who his favorite Dallas rappers are and, among other things, how much he loves his mom. So how do you like Denton? Denton is cool. College town. Real chill. I mean, the fan base is great. The students are great. Everything's cool. How do you spend most of your time outside of basketball? I hang with my friends, go to movies, go to the mall. I'm just a regular college student. Do you go to that little Denton mall? Yeah, I go there sometimes. Or I go to Lewisville mall. How do you spend your time at the mall? Probably buying something or going to the movies or playings video game — Pacman or air hockey. Sometimes, I shoot pool. We go to Main Event to play pool. Just different stuff. What kind of movies do y'all watch? We went to see Paranormal Activies not too long ago. So you're, like, a big scaredy cat? Nah, my teammate was scared, though. He was late for practice 'cause he couldn't sleep. Who was that? Put 'em on blast. Nah, I can't put 'em on blast! But, yeah, he was scared. It was [senior guard] Brandan [Walton]. He was scared. I listen to rap, gospel and R&B. I listen to J. Cole before every game. Is that your warm-up music? What is it about that song that you like? It's a motivating song. Just the whole song. How the beat comes on. How the intro is. It's cool. Do you have any other pre-game rituals? Is that your secret to success? Keeping that stuff to yourself? Alright, man. What else do you listen to? I listen to Meek Mill, Mary Mary, Mary J. Blige. Do you listen to any Dallas hip-hop artists? All the time. Yung Nation, Young Black, Big Chief. I listen to all them. Do you ever go to shows? Sometimes. Not really. You know Lady Savage? She's up and coming. Yeah, that's the next Lil Kim. Look out for her. She's from West Dallas. She's cool. Do you get back there often to visit home? Yeah, I go to West Dallas. Visit the community, visit the people and stuff. Old friends. Old high school people. Just everybody. And how's it going back home? Man, it's cool. Everybody's just supporting me and behind me. They all want the best for me. Everybody always got something to say or gives you pointers or tips. It's cool, though. Do you consider Dallas your home? I know you moved a lot during high school. Yeah, I moved a lot. Just my mom trying to find different jobs, experiencing something new and getting out of Texas. We went to Atlanta and then me going on my own to Florida. It was cool. It was just you in Florida? How was that? Yeah, I was by myself and my uncle. It was cool. I mean, I grew up a lot just by going there by myself without my mom, you know what I'm saying? It was a real humbling experience. How does your mom feel about all this attention surrounding you? She supports me. I have the best mom in the world. She's really happy for me. I can do something big and help out my family in a major way. It's just a blessing. How does it feel to have all this attention on you. I mean, CBS ranked you as the seventh best college basketball player in the country, you're an All-American, you were a standout at the Lebron James Skills Academy — all that stuff. How does that feel? Like I said, it's a blessing. I wouldn't want anything more, you know what I'm saying? It's crazy in a sense, man, 'cause coming from nowhere, then seeing all these accolades… It's crazy. What do you mean coming form nowhere? I mean, just by not being a recognizable player when I was a freshman in high school to the player I am now. It's crazy. I was cool! Real goofy, man. Chill. I mean, I had a basketball in my hand every day. I brought it to school. So, yeah, I was just that kid that was real cool and everybody knew me cause I play basketball. Does that ever get old, all that basketball-related attention? Nah, never, I love the game. It's never gonna get old. Has walking through campus changed lately? Not really. I mean, people say “What's up?” every now and then, of course. But it's cool for the most part. Do you like that you can go through campus under the radar, then go out on the court and do your thing? Yeah. Even though you have all this attention, this hype so to speak, you have to be within yourself as well. 'Cause it can be taken away at any given moment. So, I'm just really chillin'. Just being Tony. I'm a regular person. It's just that I'm blessed with a talent, y'know? I'm taking a sociology in Sport class right now, actually! We're watching this basketball documentary called Hoop Dreams. Have you seen it? Hoop Dreams is the best basketball movie ever made. That movie's cool. Talking about Willie and Arthur? I watched that movie when I was in eighth grade. Do you feel like you relate to those guys? When I watched it, in the eighth grade, I was trying to be like them and make it towards success, but, at the same time, I didn't want to fail. I didn't want an injury to overcome my career. That's a crazy movie. Who do you look up to right now? Any idols? As an athlete, l look up to Lebron. Just how much attention he gets. How much people criticize his game. I just look up to him, how he handles everything. As far as business and personal life. He explains it and handles it so well. He's a veteran at it. I look up to him as an athlete. But as a basketball player, I love Vince Carter. You must be talking about the old school Vince Carter. Yeah, old-school Vince Carter! I mean, the new school Vince Carter is cool, too. But, yeah, I love Vince Carter. What was your time at the Lebron James Skills Academy? Oh, it was cool. Same ol' same, since high school. But it was better competition. Top players from around the country and different colleges. It was cool. How was playing overseas last year with the USA Basketball Under-19 team? That was different! That's a whole different world out there, for real. I enjoyed it, though. What made it such a different world? Just the people, the atmosphere, the food, the electronics. Being overseas is ridiculous. Did you like it, though? No. I ain't gonna lie. I didn't like it. I was born in America. I'm not even trying to deal with that. I'm just a regular person. A student-athlete trying to make it, just like everybody else.